The National Motorists Association has a warning for the millions of drivers hitting the road for the busy holiday travel season: Beware of the yellow lights. The timing of yellow lights on traffic signals at many intersections is purposely set to a minimum so more drivers can be ticketed for running red lights, says the 30-year-old activist group based in Waunakee, Wis. 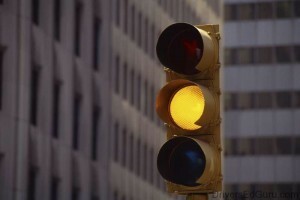 This past summer in New Jersey , the transportation department ordered 21 cities and towns to suspend the use of red-light cameras at 63 intersections because the timing of yellow lights at those locations was below the minimum established by state law. Other citiesâ€”including Dallas; Chattanooga, Tenn.; and Union City, Calif.â€”have been caught shortening yellow lights in the past decade as red-light cameras have become sources of steady revenue. The cameras snap photos of license plates on any vehicles in an intersection while the light is red, and citations, often carrying fines of $100 or more, are mailed to the registration’s address. Ironically, slightly longer yellow lights can significantly increase safety by allowing more time for intersections to clear, the group says. Biller cited one study that found just one additional second of yellow time can reduce the number of collisions in an intersection by 40 percent. Just one more abuse of governmental power to contend with. Perhaps if we are spending less money on social programs and more on roads, this kind of nonsense wouldn’t be happening? At least, it wouldn’t be happening as often.